Register Log In Britbike forum Forums Bsa bulletin board EBay A65 dating question. Hi Bruce, I didn't realise you had a '69 'Y' bike but I was aware of them. They must be very rare..
yes I did leave the out.... mainly because I know of one Y bike that appears more '69 model for what ever reason. Then there are the 'X' bikes as well. It may even be yours !.... I will see if I can get some more details. an odd case within a series of anomalies, for sure..
Now we need a 'X' bike owner to step forward. I have been thinking about what Bruce said.... A 'Y' bike shipped at the start of the 1970 season. I then wondered if they were all like that,- before the early S/N struck home. By far the majority of 'Y' bikes (A65L and A65T) have very high numbers...again up around 17xxx in many cases. Did BSA really make the same number of bikes in 1970 as they did in 1967 ? I thought they were well into decline by then. Hmmmm, we now have a situation where they used the Y suffix for what ever reason at the start of the 1970 season. Until now I assumed the largest batch was at the end of the run (going by large S/N).. Many guys here have 1970 'Y' bikes. Can anyone provide an example of shipping dates for a 'Y' machine..... be dead strange if we found one in mid-season, or even April of 1970. I have a feeling the large numbers were specifically chosen, either as a ruse or because they were certain they were never going to reach a production figure that great. I am thinking it is no coincidence that the 'Y' Spitfire hybrids and many of the (-Y) machines bore similar large numbers. I remember reading that magazine article about a chap who bought one new, I thought he said it was during 1970. He was the guy that bought the bike back 25 years later and the bike had aged 28 years. It was now titled as a 1967... (It was a 1970 Y bike). Than there are the orphan 1969 Y bikes. My number is A65LA7752Y. I posted a picture of the dating certificate a while back that says it left on 8/19/69 for NJ. Maybe it s/b be a 1970 with that late ship date, but the engine is pure 69...not having the 1970 changes for clutch entry and barrel studs. As I mentioned earlier, according to the '67 production books, the '70 "Y" machines had random numbers from 10434 to 17042 and were in the 10000, 11000, 12000, and 17000 number groups. They were dated as dispatched in January, February, and May 1970 (68 machines in May). Sorry Gary, I may have drifted off there. I missed what you said about the 1970 Y bikes. First off, here is a pic of Bruce's 1969 Y Lightning. It certainly has some 1970 features but it is the engine that is different. Ok, we know the engine was probably made and stamped earlier and then when it reached the line the 1970 cycle parts were there.. a very similar situation to the Y Hybrid Spitfires of 2 years earlier. Does the Y signify something there, ''' ok guys we have an earlier number but this is now a machine to be sold as a new season bike '''''.. ? Did Bruce say 7000 something ? a very high figure for a bike shipped at the end of August. Indeed 7700 after 6 weeks production maximum.... what did those guys do during their summer break ? Surely that figure is out of sequence... does the LAxxxxY signify something there perhaps. A 1969 engine that missed the cut, we still want to use it but can't put it into either a '69 frame or '70 frame easily.. I missed some key points in this also I am afraid Gary. Again many more questions than answers sorry. Are you saying the 1970 Y bikes are included in the 1967 production books ? We know they were not made until June 1969 at the earliest. Bruce has an engine conforming to 1969 specs and apart from that the change to 1970 engines seemed smooth and effortless. ie, not fitted to 1969 machines and yet all 1970 models have it, including almost all the Y bikes of 1970. Shane has asked this one before. Do we have documented any instance of a duplicated number. A 1967 LA or TA-Y bike in the 11,000 to 17,000 number range. ie sharing with a similar numbered Y bike.. Probably not because we know it was mainly the Spitfires and Hornets that were up around there in 1967. I guess it would be very obvious also that the duplication was there seeing as they used the same book for both. Is that the reason they used the 1967 book, - .. so there would be no duplication. The chap stamping the engine could choose a number that seemed to be spare, or available. AND.. the bikes were shipped early in the season, or at least mid-season. Jan and Feb says Gary. Last edited by Atlanta Bonnie; 06/27/11 3:15 am. Nice bike Bruce.. are you too scared to start it ? Just because the HT leads were missing when you bought it mate. Another thought.. it seems that all the Y bikes were export models. We now suspect there were three main variants or batches. Could it be that something was going on with Export Incentives, VAT clawbacks or similar and that the factory had to make up numbers later on. If for example that claims were made for bikes that did not actually exist..., holes in the S/N sequence. Is it unreasonable that these bikes were subsequently discovered (in storage directly at the end of the 1970 production line) ! They could then be drip fed back into the system via the '67 production books with a plausible cover story, or stories. In storage, or exported and then sent back or whatever. The staff must have known, they would have seen the numbers as the bikes came off the line. They would either been surmising or fed a story. The same with the USA dealers, they had seen the Bulletin and most would have physically seen the machines (1970 Y bikes). Someone must remember what the staff were told..
Good catch. She has about 800 miles on the clock now, and runs great. In fact, don�t tell anyone on the Triumph forum, but RF rode her last fall, and found her to be smoother than my Triumphs! Doubt he would admit he rode a BSA though! Last edited by Atlanta Bonnie; 06/27/11 10:35 pm. Now back to the subject bike, it appears A65LA11798Y sold for $2000. It would have to be a great start for a project at that, I hope it has gone to a good home. It was a shame we did not get to see all the Questions and Answers, going by all the revisions to the auction there must have been a bit happening behind the scenes. I'm beginning to think the real story behind these Y bikes will never be known. But no one can deny they don't exist! A65TA6950Y, A65TA7031Y and A50RA10144Y are all 1969 bikes, with the raised boss, but I can't say with certainty that they all bear the little logos. A65LA15126Y, A65LA10849Y and A65LA15824Y all have the boss, and logos, and are 1970 model bikes. This has been going on far too long. I am now tripping over myself. Surprised to see the Royal Star there, the SB did not mention them. I am 99% positive the bikes would have been stamped with the logos, I just could not make them out with the pics I had. Last edited by Kevin (NZ). ; 06/28/11 12:30 am. Wow, that is also a 69 based by clutch cable entrance�.and cylinder stud size looks 69. This is the magazine article I alluded to. 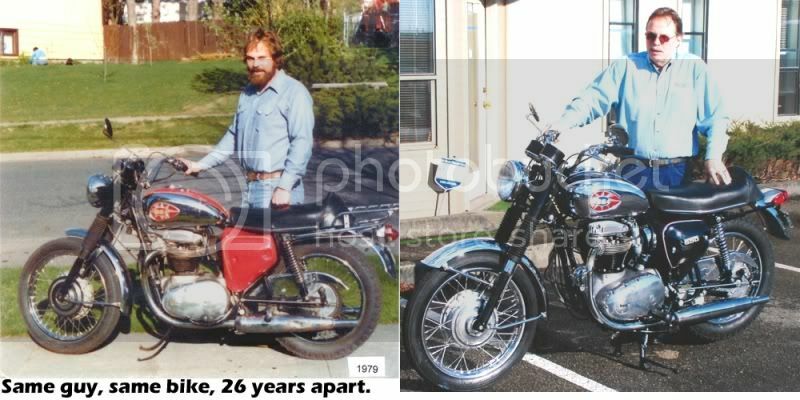 The same bloke with a Y model bike but with the photos taken 26 years apart. The red bike is a 1970 bike which I think he bought new. The black bike is titled as a 1967, .... it just so happens to be the same bike. He aged 26 years and the bike 29 during the interval. I have found the article in htm. form. The motorcycle under discussion is a 1970 BSA 650 Lightning. Or is it a 1967 as the Ownership title states? More on that later. 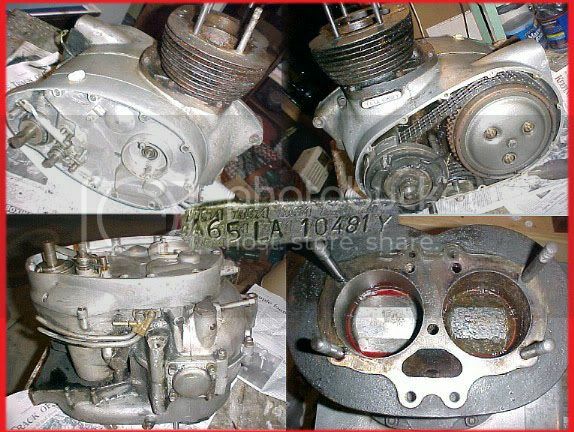 Now, I remember owning a 1970 BSA, engine # A65LA10971Y. The title represented the bike as a 1967. Frame and engine numbers matched. Checking the BSA Owners Club Website (in the UK) I had reason to believe the dating was incorrect. Now, all the Brit Bike Owners already know about the mixing and matching that took place in the waning years at the Birmingham plant. The frame for this bike was produced in 1967 and given a VIN # but the frame was not assembled and sold until 1970, when the later model parts were added and the bike shipped to USA. The engine number was added to match the number stamped on the frame in 1967 and the letter "Y" was added to indicate the assembly of an early model frame with newer model engine and fitments. BSA did not match the frame and engine numbers of earlier models, I believe they started this number matching in 1967. It rides like a BSA, it looks like a BSA, but is it a 1967 or 1970? I put my money on the latter! He then goes on and details all the engine and frame differences between the 1967 and 1970 models. He knows it is a 1970 and that the BSAOC have mislead him..
Last edited by Kevin (NZ). ; 06/28/11 1:08 am. Wish I could get younger while my bike aged. I reckon.... and these numbers have nothing to do with 1969 or 1970 production numbers. It is almost like they were running two sets of books. Which, of course, they were. Gary is saying the numbers are included in the 1967 production books. I hope he gets a chance to look into some of the numbers quoted here to give us an insight into that aspect of it. Naturally none can have been exported prior to the summer of '69..
We are getting a lot of mileage out of this hijacked thread, but it is somewhat related I guess. The 1970 Y machines I spoke of earlier are all entered in two of the three 1967 production books. The entries are not on the usual production pages. The production books each have 100 double-sided pages, so there are 200 pages. Each page has 41 lines for entries, one machine per line. The '70 Y machine entries are located on the inside of the front and back covers of two of the production books. These cover inside pages do not have any lines like the normal book pages, so the '70 Y entries are smaller print and squeezed on the pages and not very well lined up, typical of someone making entries on a blank page with no lines. The entries look like an after-thought (just my opinion). The entries are in '67 number sequence, small to large, but in random number order, ie, with many number gaps. Of the model year production books I researched, the '67's were the hardest to interpet. Everything is hand written, a lot in pencil, so some entries are hard to read. As an example, an entry may indicate a SA but next to it in the margin is a LA in different hand writing. So which model is it for that production number? I suspect since they were using '67 numbers for the '70 Y's they thought is appropiate to put the entries in the '67 books. Thanks for that info Gary, it is little wonder trying to get to the bottom of all this is such a nightmare. I came across some bottler anomalies while going though the photos earlier, - I am not sure at what point to introduce them into our discussions here. (1969 this time). I agree about the thread drift but I think we are not straying too far from the topic. We have just seen a seller try and sell a 1968 A65L that he has supposedly been working on. How he did engine work without twigging is beyond me. Regardless, he then advertises it for close to $3000.... possibly close to what it is worth. He is obviously confused about the mismatch of parts as he is even considering parting it out. He then gets mail from all the do-gooders that think it is a 1967. Yes, they have read the books and the web sites. Ok, now getting even more p*ssed off he edits the advert to read 1967. Making himself look a little stupid in the process, full credit to him for reacting. Then amongst all the questions and angst he is receiving there is an element of sense that it may be a 1970. He discovers this forum, changes the Model to a 1970, stands firm on his decision and then lets it go for $2000. This is very similar to what a large number of owners here have been through with their own machines. I only hope he has mentioned this discussion to the buyer so that history does not repeat itself again. I can name 5 owners off the top of my head that have thanked me personally for providing them with a definite answer on the dating of their bikes. The suggestion being it is a better service that paying $25 or whatever for the wrong reply. The only problem is that I feel I have not answered them at all. Years ago I suggested that we sort this out before it is too late. Doug Hele died just months after I bought my first -Y bike... and I asked the question on this very forum as part of my pre-buy. Since then Alistair Cave and presumably many others are no longer there for us to ask. We are talking about events of 40 years ago, not that long really. I think many men that were involved in the making or marketing of the bikes would remember. I believe we will get answers, and very soon. Gary has been very helpful with his insight into the records he has seen. Dare I say it but others have also seen these records and almost closed ranks on us. The BSAOC UK been very quiet, or worse, on the situation. I was always under the impression that the answers were going to come from the Midlands area, I am less sure now. It may well be it will come from the States, that seems to be where the bikes were sent to. The dealerships had to explain to each and every customer why their new bike had funny numbers. RF and John Healy were in the industry and they both have good recollections of events in that era. I believe others that were more involved in the BSA marketing and sales are still about and active. Perhaps we should be seeking some input from those guys before the years roll on further. Previous discussion on Spitfire production numbers. This excludes the Mark III Spitfires upgraded to Mark IV specification. 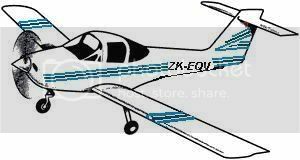 These are composite figures and so each year would have home, USA East Coast, West Coast and export specification models. I am having trouble comprehending these figures. I doubt the comments from the BSAOC Librarian are helpful also. How can an incomplete bike be exported ? We know 1967 Spitfires are plentiful, even the Dash Y ones are everywhere. I would put money on there being many more MkIII than MkII bikes about now. Less than 500 MkIV bikes, so with the several hundred that we now believe were Hybrid added to the mix that makes over a thousand..ok, fair enough, - but that also means every second MkIV Spitfire is a SA17000Y bike. The quality of those hybrid bikes must have been sh*t, - only a small percentage have survived compared to the 'true' 1968 MkIV models. The SB machines are more plentiful to my mind. Last edited by Kevin (NZ). ; 12/27/13 12:10 am. Aww,[email protected] hell,now im really confused.What do i have...A65sa100...-y eng and frame no the same registed as 1967 ??????? Hmmm worth more? not likely.but what have i got.It is a 1967 spitfire isnt it?? G'day Crazy, sorry mate you just have a bog standard 1967 MkIII Spitfire. Common as, specially with the Dash Y suffix on the engine. We all have them. How there can be more 1966 models is a mystery to me. that we were wondering about.... the A65SA17xxxY bikes. I have seen pics of you on your bike, it is a good looking example. My production book research can easily dispel the "471" production total of the true '68 Spitfires, (as well as the 200 or 250 total of the '68 Firebird Scramblers from previous posts). It is only about a third of what is recorded in the books. As I mentioned earlier one of the the '67 books have 478 SA Y's (hybrids) dispatched in '68. Even so, the ('68 SA Y and SB) are still the lowest year produced of the three years of the Spitfire. I too, am curious oabout the higher number of '66's than '67's. With such a big error in the total '68's, I am not sure that I can trust any of the production numbers in that Alistair communication. The lowest SB is numbered 2478, and went to Mexico in 1/68. Other higher numbers were dispatched in 10/67. The lowest numbered SB to the US is 3048 in 11/67 to the east coast distributor. The highest number SB was 10618 to Sweden in 7/68. I am not sure that I can trust any of the production numbers in that Alistair communication. You are not alone there Gary. Thanks again for digging up those interesting facts. What a way to run a business, surely someone at BSA must have had some idea of the numbers of bikes they were making and selling. We know the bulk of the machines in question were exported, is there any way of getting access to the records of the US distributors ? While we would all like to know specific details of each of our own individual bikes we can see that is just not possible in many cases. The records as they stand appear incomplete, erroneous and worse. (Misleading). The crime in my eyes is that no-one can accurately date some of these models. It is almost like best guess will do, I can only imagine what some of the vehicle registration authorities make of all this. I can see the problem the BSAOC dating officer has, but basically what he says goes. It is great for getting machines legal and VIN'ed but does not necessarily help the owners further down the road. Of the engine numbers of the bikes, 1966-1970, that I have looked at in the past few days you can see trends. I know Gary can work from them also. They may be the numbers themselves, the style of stamp, the size of some particular stamps, other adjacent markings, casting marks, grinding marks or other indicators. There is definitely a pattern and a flow. If it is not in order, ie if just one of these indicators is out of place it stands out like dogs balls. That is just the engine number. Frames are much the same, certain features would be present during certain eras. Naturally with BSA being British there are exceptions, we expect that. The passage of time has to be factored in also. Sellers will still try and introduce lies into their sales pitch, - another good source of confusion and rumour. We have all seen them, indeed a large percentage of adverts on eBay seem to be flawed. Some like the bike we have been debating are just honest mistakes. At the moment it is just a case a 'buyer beware' and you get what you are dealt. A number of owners here must still be wondering exactly what they have invested in. You and Kevin have shed a lot of light on this. Definitely moving it forward. Thanks. The only statement I believe on my BSAOC dating certificate is the 1969 ship date that probably came from the 1967 book Gary E mentions. Here�s a pic of dating certificate again. No way my bike is a refurbished 67. Also want to say these guys do this on a volunteer basis,and I really appreciate that, and the facts on these Y bikes are muddled for sure. Thanks for posting that copy again Bruce. We know that no part of your bike existed in November 1966, - so what bike is he talking about ? He seems so certain with his dates..
Perhaps they do have different records to those that Gary has seen. The implication to me is that the same numbers have been used twice, - once as a 1967 model and then again three years later for your bike. I am not suggesting that a LA77xx or a LA77xx-Y bike physically exists but I think we have to admit it is a possibility. I believe the chances are more likely that it existed on paper only until it was discovered parked not far from the end of the A65 production line in mid-summer of 1969. It did not leave the factory in 1966, go to the port, come back, go into storage for over two years and then get a massive make-over to become an early 1970 model. I hope people here are intelligent enough to understand that. Well I know at least three wise men.. Sorry Eric, I was slow to realise that there is now a third batch of Y bikes. This was from 2 1/2 years ago and I was thinking you had a MkIII at that time. I can now see you have one of the batch of MkIV bikes that were shipped in the period April, May and July 1968. I have brought this back up as again it shows the two shipping dates that the BSAOC Dating Officer seems so keen on. Gary was researching your case at that time and he will have an idea of what you bike did during that year or so.... again,- if indeed it physically existed in May 1967. At least in your case there is every chance a bike could exist. We are talking the second grouping of Y bikes here now, - the 1968 model Y Spitfires, the A65SA17000Y machines. Have you managed to determine a manufacturing date for your bike at all ? Some items, if still original, may have dates on them.... Coils and oil pump come to mind. Several other Lucas components may also, - rotor, brakelight switch. The oil pump in particular would be an interesting one. What would we think if it was dated after May 1967 ? Actually the same question could be asked of any SA17000Y owner, does anyone know their oil pump DOM ? A restyle operation would be straightforward, change of front end, headlight and rear fender tail-light unit and rear shocks. Tank and side covers, or at least a decal change. Actually the tanks are dated also often, - in this case I would not be surprised with a 1968 date.